Turin-licious: comfort and cosyness, right in the city centre! Property 111: Turin-licious: comfort and cosyness, right in the city centre! 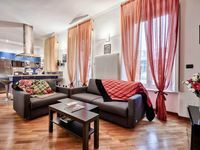 Casa Mazzini, a lovely apartment in the city center. Property 116: Casa Mazzini, a lovely apartment in the city center. Savoy Exclusive Duplex - for 4 people! Property 120: Savoy Exclusive Duplex - for 4 people! Property 125: Welcome to the stunning landscape of Asti, in the heart of Piedmont. The apartment was clean, comfortable and very conveniently located in Torino. The host was very responsive to questions and assisted me up and down the stairs with my luggage. Wonderful apartment in a nice area near center of Torino and Silvia was the best! We loved this apartment! The kitchen is well equipped, the decor is lovely, the bed is comfortable, and there were extra towels. It is about a 15 minute drive from the city-center of Turino. The neighborhood is safe and has nice cafes and shopping in the area. We had a rental car so the gated car-park was a huge plus for us. The best part of this rental was Silvia who lives next door. She was exceptionally gracious and accommodating way above the &quot;call of duty&quot;. For example, my adapter broke and she lent me her iphone charger and let us use her clothes dryer for things we needed immediately. I would definitely stay here again and recommend it to my friends.